An offhand question got me ruminating on plums. This started out metaphorical; ruminating as in thinking about or pondering. But ruminating also means chewing on, and Nugget Market had a beautiful display of plums. So I paid the flown-in-from-Chile price and ate some. Just to get the juices flowing. Metaphorically and literally, again. Her question was "do you have any heirloom fruit trees? I've heard they're better than hybrids." Now this dichotomy of heirloom vs. hybrid usually comes up during the spring vegetable season as the popularity of heirloom tomato varieties has increased in recent years. Advocates tout flavor, historical value, regional adaptability, genetic diversity, and more. Plus, you can (carefully) save the seed from your heirloom tomato and it will grow (mostly) the same variety next year. You can't do that with hybrids. Hybrid varieties generally have better disease resistance, greater vigor and productivity; many are more regionally adaptable, and many have outstanding flavor as well. Nearly every plum you buy is a complex interspecific hybrid between Japanese, Chinese, and sometimes American species. Luther Burbank spent more time on plum hybrids than any other plants, estimating that he reviewed 7.5 million seedlings. Many varieties that he introduced in the 1890's remain favorites today, including Santa Rosa, Satsuma, and Wickson. 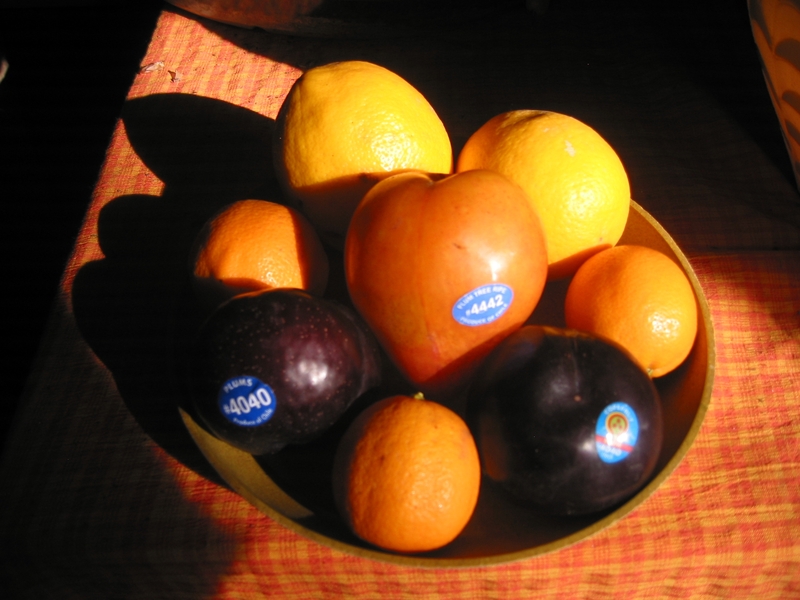 Shown above are some commercial plums grown in Chile, along with some Meyer lemons -- which are also probably hybrids, most likely between a true lemon and a mandarin. But does the term heirloom apply to fruit trees? And what does it mean, anyway? The folks at the Slow Food movement (www.slowfoodusa.org) have developed an Ark of Taste: lists of plant varieties that they believe should be grown, sought out, and appreciated, including what they call heirloom fruit varieties. Some they believe are on the brink of extinction, at risk of being displaced forever by newer commercial varieties. Others have just been around for a long time and have special merit for flavor and history. A few examples suited to California: Sebastopol's Gravenstein apple, the Blenheim apricot, Meyer lemon, Mission olive, important peaches such as Fay Elberta, Rio Oso Gem, and Sun Crest, and plums including Elephant Heart, Laroda, and Mariposa (which was bred in Winters in 1943). Since many of these are hybrids, clearly this definition of 'heirloom' is based on longevity. Meyer lemon was introduced from China in 1907 by USDA scientist Frank Meyer, and is probably a hybrid between a true lemon and a mandarin. Elberta peaches were from the prodigious breeding efforts of Luther Burbank, who also introduced many of the plums that we know today, as well as the blight-resistant Burbank potato, Shasta daisies, and many other garden treasures. Sometimes a variation occurs naturally, gets noticed by a grower, and is propagated clonally. More often, fruit tree varieties have been intentionally created in hybridization programs. Rose growers use the term heirloom to refer to any rose variety that was in existence before 1867. That is the year that the first Hybrid Tea rose was introduced. This cross between Hybrid Perpetual roses and the sensational new Tea roses that had been brought to England from China revolutionized the rose industry, creating the class that has dominated the nursery and florist trade ever since. So all those old Hybrid Perpetuals, Bourbons, and other types that you would have found in any early 19th century garden? Those are the heirloom roses. Vegetable growers tend to use stricter definitions of heirloom. Some say it only includes varieties introduced before 1951, when hybrid varieties from inbred lines were introduced. This seems a little arbitrary. Burpee Hybrid tomato was introduced by W. Atlee Burpee Co. in 1945. Hybrid corn was invented in 1879 and grain hybrids from inbred lines were introduced in the early 1900's. But it wasn't until the 1950's that hybrid varieties became common in the seed catalogues for home gardeners. More commonly people use the term to apply to old "open-pollinated" varieties. Let's say you get seed of a good tomato from a friend. You like it because it grows big, produces lots of fruit, and the fruit is very tasty. Or unusually large, or a different color, or striped. So you save the seed of the best producing plants and you grow that the next year. Since tomatoes are self-pollinating, all you have to do is cover the flower to make sure no stray bee brings pollen from another type of tomato. Each year you save seed only from the plants that have those desirable characteristics, and grow that seed the next year. You haven't crossed selected parents to create your seeds, as is done with hybrids. Your seedlings are not exactly the same, but they are close enough to be considered homozygous. Within a few generations the traits are stable and the variety is established. That's how old varieties such as Brandywine, Mortgage Lifter, Mr Stripey, etc., have been preserved and passed on for generations. Sometimes people want to know if the seeds or seedlings are "genetically modified." While traditional hybridizing could be considered a form of genetic modification, usually the term refers to new plants created by gene splicing: inserting a gene, as with CalGene's FlavrSavr¨ tomato introduced in 1991. No seeds or seedlings available to home gardeners are created this way. Bred and introduced by Floranova of the United Kingdom, the Angel (TM) violas are hybrids between pansies (Viola wittrockiana) and violas (Viola cornuta). Flowers are smaller than pansies, but hold themselves up better in the rain; larger than violas, with the abundant bloom of that species. Shown here is uniquely striped Angel (TM) 'Tiger Eyes'. Floranova also has operations in Costa Rica. "A new pot cyclamen averages 10 years of constant attention, while the tuberous-rooted begonia takes about 12 years. 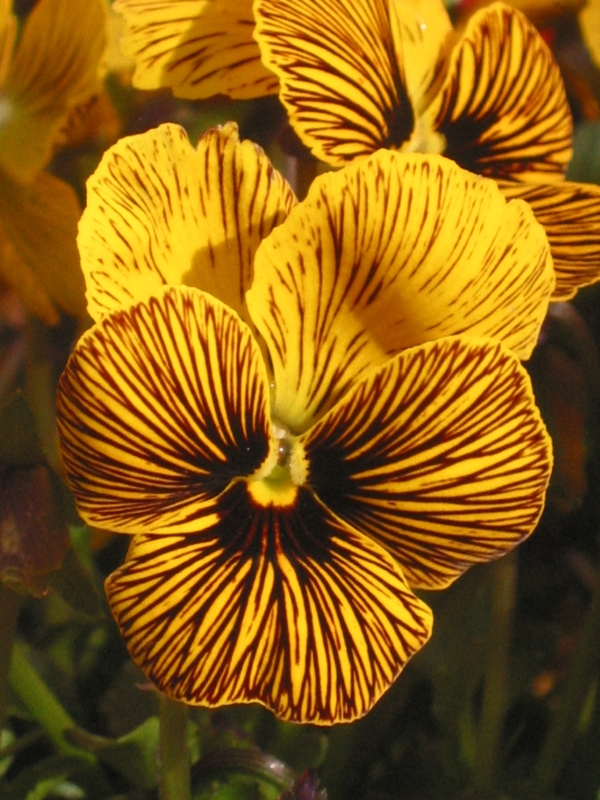 On the more optimistic end, an experimental pansy breeder can introduce a new cultivar in about 3 to 4 years. Tomatoes average 4 to 5 years, bell peppers 5 to 6 years and cucumbers and squash 7 to 8 years. Our recent Heronswood Hellebores took 13 years-from the first selections in 1993 to the introductions in 2006. (Yet, consider how inexpensive flowers and vegetables are.)" Helleborus orientalis, the Lenten Rose, is an easy-to-grow perennial that will bloom in full shade, in winter. For many years only seedlings in a limited range of colors were available, and the difficulty of propagation made the plants expensive. 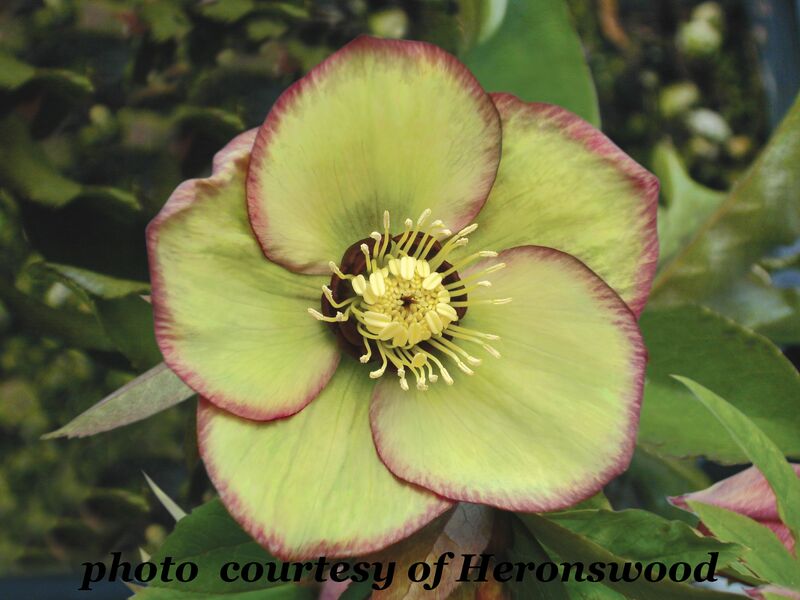 Heronswood Nursery began a breeding program, selecting for a wider range of colors and for two-toned flowers. After 13 years, the first hybrids came on the market. Shown here is 'Phoenix', an ivory white flower with a distinct pink edge. Photos courtesy of Heronswood Nursery. Dr. Carl Whitcomb grew 26,000 Lagerstroemia seedlings before he found the wine red foliage he was looking for in the fourth generation. The fifth generation yielded mildew resistance and fragrance, and true red flowers emerged in seedlings of the sixth generation. Some crape myrtle seedlings will flower in the first year, but most take 2 - 6 years. After seven years he had narrowed the seedlings down to a few, including the bright red Dynamite¨ that has become so popular. By 1999, 14 years after embarking on his quest for mildew-resistant crape myrtles with vivid colors, Dr. Whitcomb had grown over 160,000 seedlings. His patent on Dynamite¨ and several other varieties provides some income, but clearly this is a labor of love. Breeders take a variety of steps to speed up the process. One of my first jobs as a teenager was tying up cantaloupes. The breeder was growing them in a greenhouse for faster growth, hand-pollinating them, and my job was to fashion slings from his wife's old pantyhose to suspend the fruit from trellises in order to save space. Cantaloupe vines are itchy and greenhouses are hot. I don't recommend this job. A fruit tree seedling may take 3 - 5 years to produce fruit, but if the seedling wood is budded or grafted onto a mature tree it will fruit sooner. Breeders of annual flowers and vegetables maintain growing facilities in the northern and southern hemispheres to double their growing seasons. "They 'grow out' selections every six instead of twelve months-and spend a lot of time flying back and forth to Peru, Chile, South Africa, Southeast Asia, Australia and New Zealand," says Ball. So in the world of fruit trees, an heirloom variety is simply one that has stood the test of time. I don't recommend getting too dogmatic when it comes to tomatoes. I always suggest planting some hybrids such as Early Girl and Celebrity for reliable production and flavor, and some heirlooms for variety. Most of the heirloom tomatoes are regionally adapted to the east coast or Midwest: Brandywine, the famous Amish heirloom, barely produces in the Sacramento Valley heat (my plant produced four fruit last year). California gardeners need to start developing our own seed strains. Then if we wait fifty years or so, we can call them heirlooms.